Jackrabbit has designed the Web Registration form in such a way that you can easily control and edit it from within Jackrabbit. Any changes you make and save are immediately seen on the Registration Form. Our one page form is mobile friendly and YOU control what is shown and required. Your own company logo can be added so that it appears at the top of the form. See Organization Logo for instructions. You will use the steps below to set up and customize your Registration form. Initial set up of your website Registration Form will take between 15 and 60 minutes. Go to Tools > Edit Settings > Organization Defaults and at the bottom of that page make sure your Time Zone and Daylight Savings Time is entered correctly. This ensures the system will date and time stamp the registrations accurately. See our Help article Web Registration Form: Field Options / Labels for instructions on adding your Field Options/Labels and Legal Policies pages. From Tools > Online Web Registration > Settings. This is the first of three pages you will need to set up. The other pages are Field Options / Labels and Agreement Text (Legalese). Click the Preview Registration Form button to see exactly what your customers will see. You can even fill out the form and complete an actual registration to step through the process! Notes here will appear at the very top of your Web Registration form. The Header Text box supports basic html and has a 500 character maximum. If set to NO, the family/student can register the family information but NOT enroll in any classes. This is a quick way to turn off all online registration capabilites. Choose from Request a Class, Schedule Template Optional, or Schedule Template Required. 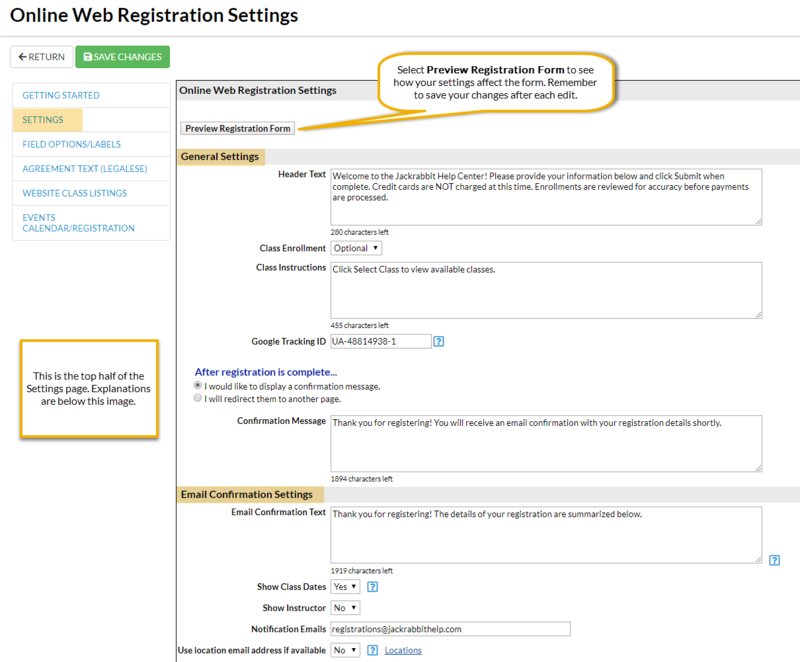 See Web Registration Form - Scheduling Options. Notes here will appear right above the Class Search area in the Web Registration form. If you use Google Analytics this is where you will add your Google Tracking ID so that each Reg form "hit" is counted. After the form is filled out and the registrant clicks "Submit Registration" , i.e. registration is complete, you have two options of what happens next on their screen. Choose one and the correct field will display. This note will appear on the screen immediately after the form is submitted. The character limit for the Confirmation Text box is 2,000. Use text only - use of html/hyperlinks in this text box can cause errors. After registering for a class, you can take your user to another page in your site, or to another website altogether. To do so, enter the full URL to the page or website. That means the link should have http:// or https:// at the beginning. Your customer will no longer see the Jackrabbit Confirmation Message text since they are being taken to another page. They will still receive a confirmation email from Jackrabbit confirming their registration was successful. This note will appear in the email confirmation that the customer receives. This box supports basic html and has a character limit of 2,000. Do you want the class instructor's name to be included in the class details on the customer's email confirmation? Where do want your organization's copy of the confirmation to be sent? If you have multiple locations you can default the confirmation to go to each Loc's specific email (as set up under your Locations). Would you like Jackrabbit to automatically post a "Registration Fee" (such as an annual or session fee) onto the family account? This setting impacts only NEW customers registering (creating an account) for the first time. Managing Annual Fees for your existing customers is handled via Post Annual Fees. "Always" means it will post the Registration fee whether or not they enroll into any class(es). "Enrolling in a Class Only" means it will post the Registration fee only when at least one class is enrolled into (Trials and Waitlists do NOT count as a class enrollment). Choose whether to charge the fee per Family, per Student, or per Student each Class. Set the price(s) and set a maximum if needed. Enter the amount to be posted, for either per family, per student, or per student per class, when a family registers online as a new customer. Choose how you want the fee recorded (your Transactions are set up under Tools > Edit Drop Down Lists). Assign a Cat 1 value for proper revenue reporting - generally you would use Cat1=Registration Fee. This is primarily used when you have concurrent sessions available for Registration. This value only works when you Post Fees PER STUDENT. This setting determines that instead of the Session Value (above), the Session Value of the FIRST class that is registered for is used. If YES, you must have Post Fee set to STUDENT. This means that when someone registers, the Session value on the Class Page (and registered for) will determine the session value marked on the Registration Fee(s) posted. The First Registration determines the same value for any subsequent registrations. If you use this feature and your Fees are set to post per FAMILY then the default Session value (above) is used. Most organizations leave this blank so the current session is used. Assign a consistent Session value that will be on all posted transactions if desired. Do you require a credit card or is it optional? You can also hide this field completely if you accept only bank drafts. Check ONLY the boxes by the cards you agreed to accept with your Merchant. Those icons will appear in the form. For example, if you do NOT accept American Express, then make sure the Amex box is NOT selected. Do you require a bank account or is it optional? You can also hide this field completely if you accept only credit cards. If you mark Credit Card Required and Bank Account Required both to YES, you have the option to tell Jackrabbit if both are required or just one of them. If the class is full, do you want to allow students to be able to put themselves on the waitlist? This will also provide a Waitlist link in Portal and Web Reg Class Search results. What impacts the number of Class Openings? Do you want Waitlisters or MakeUp students to affect the number of openings available for online enrollment? Set each as you wish. Online Registration pertains to class Registration Form, Parent Portal, and Class Listings tables. Quick Registration pertains to your staff use inside the database under Families > Quick Registration/Add Family. Use the question mark icon for a pop up example and explanation. The gender filter can be used if gender is assigned on the class page. This will remove classes that a registering student does not meet gender requirements for from the list of classes available. Use the Age filter to limit the class search results to only show classes that the student is within the age range. Class MUST have both a Min and a Max Age assigned in years and months. A class may also have a Cutoff Date. If a Cutoff Date is listed, the student's eligibility for the class is determined by their age on the Cutoff Date. If no Cutoff Date is assigned for the class, the Class Start Date is used to calculate the student's age. For example, if the Class Start Date is today or in the past, today's age of the student is used to calculate eligibility. If the Class Start Date is in the future, the student's age on the Class Start Date is used to calculate eligibility. Use this section to re-name your Category Codes to a descriptive, meaningful label applicable to your Category designations. 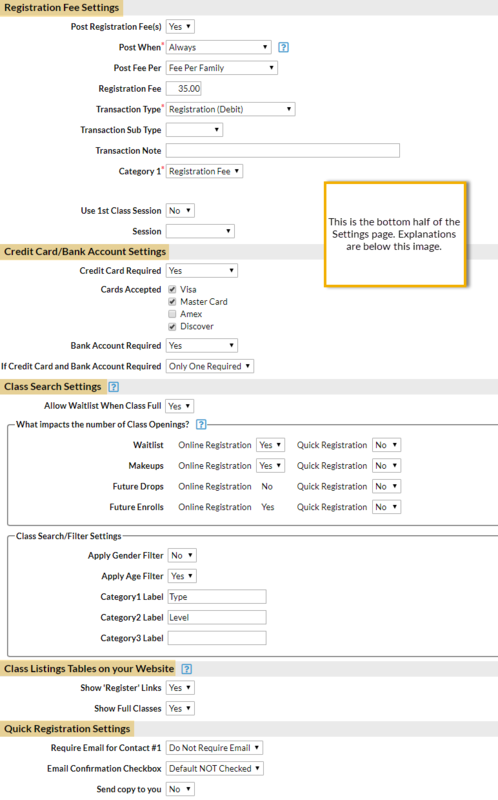 If you want to hide specific information in the class search page, see our Help article Modify the Class Search Page in the Web Registration Form for details on hiding columns. If YES, the left-most column will contain direct links to the Registration form. If NO, the class data is still shown but there are no links for enrollment. Do you want classes that have no openings available to show in the tables? These settings affect the Quick Registration that is used internally (Families > Quick Registration/Add Family). This controls whether you want emails sent after each Quick Registration and whether you want to require contact #1's email address (recommended).